Just saw this last night. I really enjoyed it, especially Imogen Poots, but way too gory for me to fully get into. You should have mentioned in the post that this has Patrick Stewart playing an evil neo-Nazi skinhead leader. :) That's pretty much what's gonna get me to see it after it opens wide next weekend. Well, that and the fact that writer/director Jeremy Saulnier's previous film, the partially-Kickstarter-funded Blue Ruin, was a surprisingly tight and suspenseful little noir, even if the last 30 minutes didn't live up to the promise of its great first hour. This one seems like a neat claustrophobic setup, and while reviews like this have me not expecting too much (and hoping Saulnier writes something less ridiculously gore-splattered next time), I'll support him and take the ride. He got the script, and when he read it, he was home alone in the English countryside, and started reading it as dusk was falling. He says that after only thirty pages, he paused, put the script down, and got up and checked that all his doors and windows were locked, double- and triple-checked the home security system, and then poured himself a very large Scotch before picking the script back up to keep reading. I haven't seen Blue Ruin yet, but I really enjoyed Murder Party. I hope he returns to horror-comedy someday, there are some many terrible ones out there and he has a real knack for it. I'm going to a screening of this tonight with the director! I'm... probably not ready. This is an intense, claustrophobic movie. The gore was really hard to take, for me, but I think it does give it a visceral (sorry) punk rock atmosphere. And the dogs, man. So terrifying, and yet so cute. Nice to see Alia Shawkat as well. I finally got to see this yesterday. It's great. Lots of tension, and of course Anton Yelchin is great in it. (I loved him in Odd Thomas.) Patrick Stewart is great, but some of his lines are muffled and hard to hear. But oh, I love how this is directed. I'm looking forward to whatever this director does. I thought this was excellent and was legitimately unsettled by a number of scenes. Loved Blue Ruin as well so will be keeping my eye out for this filmmaker in the future. I'd been itching to watch this, and yeah, some of the gore was hard to take for me too. But man. This was a good, good movie. I mean, I watched for the Patrick Stewart, but stayed for all that preceded and followed. mediareport: This one seems like a neat claustrophobic setup, and while reviews like this have me not expecting too much (and hoping Saulnier writes something less ridiculously gore-splattered next time), I'll support him and take the ride. 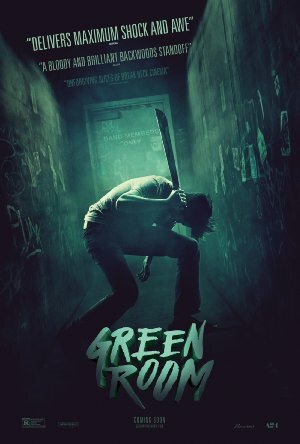 The director has found a sharply attuned ally in Sean Porter, who articulates the cramped spaces and bleary economy of light in the club (given a near-perceptible stink by production designer Ryan Warren Smith) with aplomb.